After Pat Albeck left Horrockses she went onto work for a number of prestigious companies. The design Pat is probably best recognised for is her Daisychain pattern which was created for John Lewis. The design was created in what she calls her “Physcadelic period” it was a John Lewis best seller for 15 years coming in a variety of colour ways. One colourway (in varying shades of brown) was known as the Rank Hollis McDougal! ( I hope I have spelt this correctly)This design takes some inspiration from William Morris with its mirrored floral repeat. Whilst talking about the design Pat amused me saying that she dislikes the word florals feeling that flower designs better describes her work! She also said she preferred to say that things sell well rather than that they are commercial! Pat went on to do a lot of work for the National Trust (whom she still works for now!). She designed prints for a wide variety of mediums including textiles and pottery. She said that whilst working for the national trust she learnt to be a lot more careful with her designs whereas when at Horrockses she felt she could be a lot more flamboyant. Many of the designs were much more muted in terms of colours and had to follow strict guidelines that the National Trust set out. 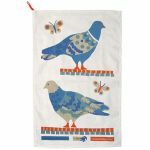 Whilst working for the National Trust she has designed over 300 tea towels. These have included calendar tea towels every year and those which represent specific national trust buildings. A tea towel takes her around 3 weeks to design in total. One week for the rough and two weeks to draw up the final design. She works first on a design a 3rd of the finished size, which would normal take around a day and a half to execute. Working on a small size is important because time would be wasted if a full scale design is completed and it is not liked. 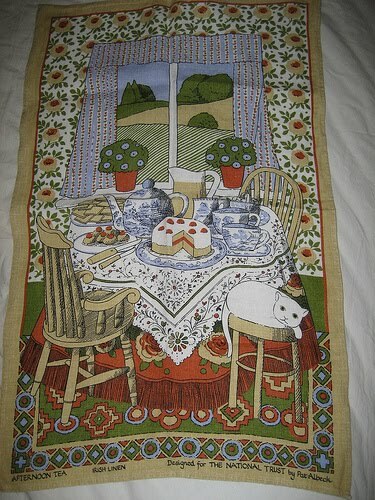 Pat designed a series of tea towels last year for Emma Bridgewater (Emma is her daughter-in-law). These show she still has a fresh creative energy. I particularly love the pigeon design one (who knew a pigeon could look so beautiful). What amazed me most about Pat is that at 81 she is still working and not only that, she is still creating designs that are as innovative and modern as designers sixty years younger than herself are creating. Anyone who reads my blog knows that I have a worrying obsession with the fashion brand Horrockses. Last Friday I had the opportunity to go and see the Horrockses exhibition again, this time at its new location Basildon Park near Reading. Connected with exhibition there was a special talk by Horrockses print designer Pat Albeck. Not only was Pat lovely, she was completely inspiring and despite not really being a print designer it gave me a desperate desire to get designing! As soon as I entered the room Pat spotted me, coming up to me and saying “That’s one of my designs!”. 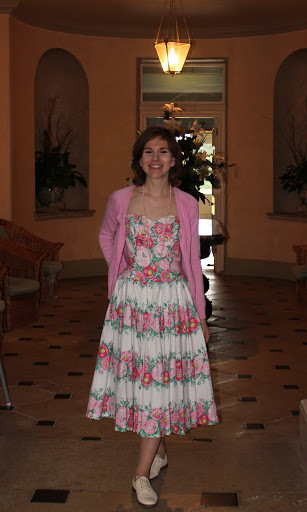 I was wearing one of my many Horrockses dresses, although I have to say the one I chose is one of my favourites. She asked me if she could touch it and said about how lovely the dress still felt after all this time, asking me to come up and do a twirl for the audience! I had a feeling that the dress I had chosen to wear *might* be one of her designs but I was very glad that my suspicions were correct! Pat began her career with Horrockses whilst she was still a student at the Royal College of Art. James Cleveland-Belle the then Director of Horrockses was keen to use the design skills of some of the students from the college and spotted Pat’s work. Cleveland-Belle went on to become a great friend and also one of Pats inspirations. She says she remembers the magical feeling when Cleveland-Belle signed off one of the sketches JCB meaning it would go into production. 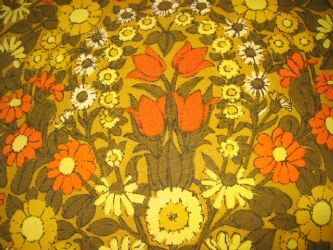 The first design which Horrockses bought from Pat was this iconic pattern which has been used again recently by the V and A for a new range of Horrockses based textiles. Whilst at the Royal college Pat had two of her designs commercially produced by Horrockses. The Royal college of Art felt it was important for their students to work within industry encouraging Pat to spend one month at college and one month working for Horrockses. Pat also remembered a dress which she owned before working at Horrockses ( a member of the audience piped up that she remembered Pat wearing it and looking beautiful in it!). 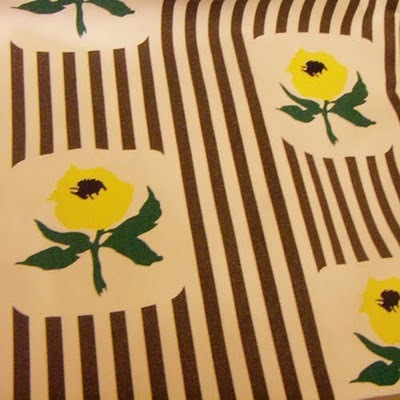 The dress was lemon yellow with stripes and little egg shapes with flowers inside. During the five years Pat worked for Horrockses she designed a wide variety of different prints drawing inspiration from all sorts of things around her. Employees at Horrockses were encouraged to used their holidays to inspire there work and Pat remembers a holiday in Venice which particularly inspired her work. Pat found that she drew anything that grabbed her, buildings, kitchens, gardens, flora and fauna. Pat felt that the luckiest thing was that she was designing fabric for actual dresses which she would see made up. 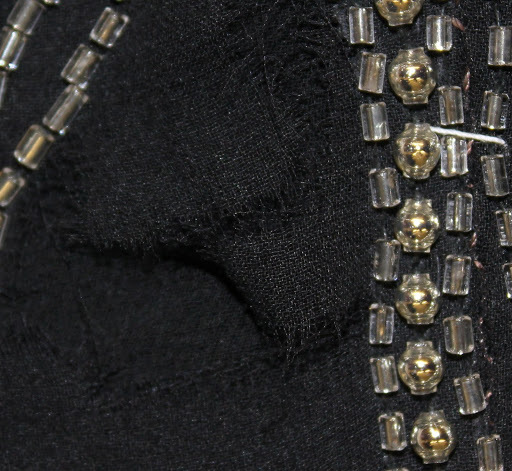 Her designs were not to be sold as fabric to be made up by the general public. She liked to have a specific dress design which she knew the design would be used for and the knowing precisely what her fabrics would be used for. One of her oddest requests for a print design came from John Tullis (who designed most of the “specials” and evening dresses). The design had to incorporate a lobster. I have to say this is probably one of my all-time favourite Horrockses prints, and I love the way the lobster is softened by its combination with the butterflies and flowers. After 5 years with the company Pat left in 1958 with Cleveland-Belle gone Pat felt it was time for her to move on too. I will write further about Pat’s later career in my next blog post. Sob. There is one thing that makes me ever so sad about working in museums, putting all the objects away! A few weeks ago we took down the Little Black Dress exhibition and I have spent the been putting everything back away into the stores. Most costume can only be left out on display for short periods of time because they can be easily damaged by light and varying heat. 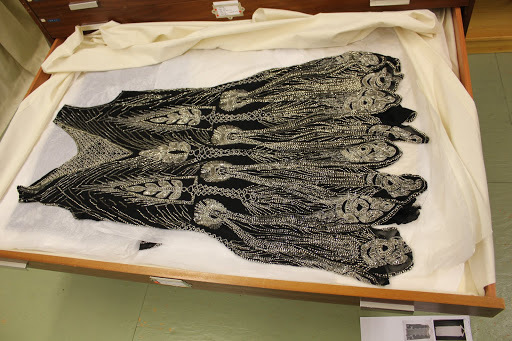 Some garments can only be left out for short periods of time because of their weight, and some of the dresses we had on display really displayed how much of a problem this can be. This beautiful dress is a prime example of a mid twenties flapper dress. The peacock inspired embroidery is simply breathtaking and I am sure the original owner would have looked the bees knees in this dress! The dress has been on display since November (first in Dazzle and then in Little Black dress) and this 7 month stint is as long as the dress can realistically take and will start to show signs of more damage if left out any longer. 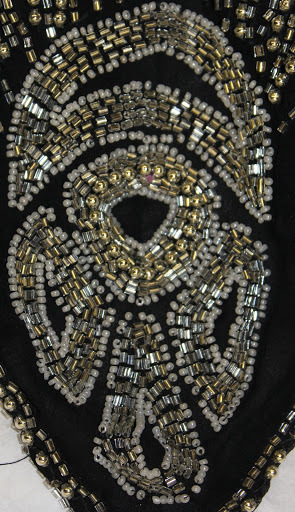 Here are just a few pics of the dresses beautiful embroidery. I think it has to be one of my favourite pieces in the Hampshire Museums service collection.